I keep giving myself jobs to do. I keep making lists. I am definitely a list maker. I keep adding to my lists, but there's nothing more satisfying than crossing off an item that's been sitting on the list waiting for some attention for a long time. 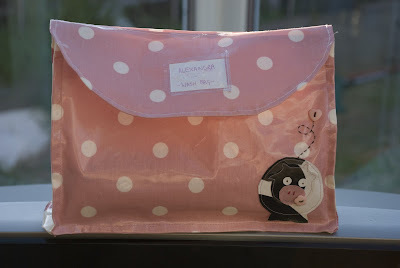 Meet Alexandra's wash bag. 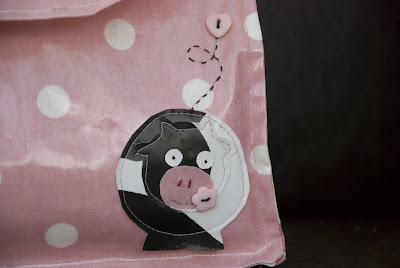 I love the little cow! The whole thing just evolved as I was working and is made from left overs of Alex's coveralls. Alexandra gets really bad eczema especially on her hands, so we have to take her own soap, towel and cream where ever we go, and also send it into nursery. We've had many make do and borrowed bags up until now, always with the intention (and the promise to Alex) that there would be a special bag made just for her. I'm so pleased with it! 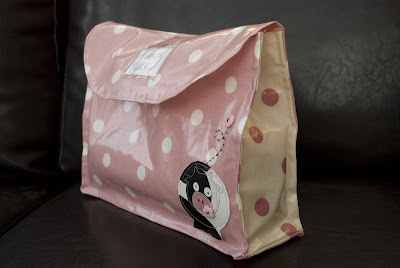 Since the photos I've added 2 press stud fastenings and hidden the stitching behing two round pink buttons.